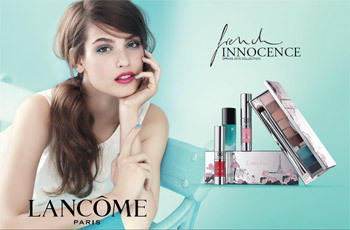 With the French Innocence collection, Lancôme celebrates a unique signature of femininity, an effortless chic that is youthful and infused with springtime freshness, yet resolutely sophisticated. In terms of colour, a multitude of pinks from the capital's most beautiful gardens; from Bagatelle to Monceau pink, the green of the Tuileries gardens, and a soft grey to highlight her city spirit. Resplendent shades inspired by the springtime lights are accentuated by the radiant pastels of urban nature re-awakened. From daring to tender, from electric to soft and sensual… it is a seasonal mix & match. Awakened by the soft rays of the sun on her face, she heads to the bathroom. She picks up her new palette in this season's shades. A few colours blended with her fingertips, a little khôl, some layers of mascara, plus the finishing touch: her Lip Lover. She slips into a little white dress: it's time to go and savour the irresistible delights of Paris in the first days of spring. With the French Innocence collection, Lancôme celebrates a unique signature of femininity, that effortless chic that always comes with a twist… this je ne sais quoi, the Parisienne's singular signature. An effortless chic that is youthful and infused with springtime freshness, yet resolutely sophisticated. In terms of colour, a multitude of pinks from the capital's most beautiful gardens; from Bagatelle to Monceau pink, the green of the Tuileries gardens, and a soft grey to highlight her city spirit. Resplendent shades inspired by the springtime lights are accentuated by the radiant pastels of urban nature re-awakened. From daring to tender, from electric to soft and sensual… it is a seasonal mix & match. My French Palette recreates a sunny springtime ambiance with its elegant silver case adorned with coloured drawings in pure Parisian style. On opening, the palette reveals three matte and 3 iridescent shades. Offering a daring twist, the lid contains, like a secret garden, three impertinent shades including two liners for both day and night looks. Apply a light veil of shade 1 over the whole lid, up to the eyebrow arch. Use shades 3, 4 and 6 to create your smoky eye, working from the centre of the upper lid to the outer corner. Blend the shades to create a graduated effect. Accentuate the eye by applying shade 8 to the lower lash border. Add a touch of light to the inner corner with shade 7. Apply shade 7 from the inner corner to the centre of the lid. Apply shades 5 and 6 working from the centre of the lid to the outer corner. Add subtle depth to the eye using shade 2 under the eyebrow arch. Accentuate the eye by applying shade 8 along the upper lash border and shade 9 along the lower lash border. Lancôme draws inspiration from the colours of the capital to create four new shades for the ultra-cult Vernis in Love range. Nails are dressed in an intense grey paying homage to the rue de Rivoli, a vibrant green like the foliage of the Tuileries and two shades of pink, plucked from the flowers of Monceau and Bagatelle parks. Colours to coordinate or combine in line with your mood and desires! An incredibly simple technique for bi-colour nail art. Start with a coat of Vernis In Love Gris Rivoli over the whole nail followed by Vernis In Love Vert Tuileries, avoiding the outer corner in order to create a little grey square like a door leading into a secret Parisian garden. The spring colour collection is joined by three soft new Lip Lover shades. From the tender elegance of Monceau park to the joyful pink of the Place des Victoires, and the passion of the secret Bagatelle garden. Unmistakably, three must-haves for this season's Parisienne! To offer more volume to lips, apply Lip Lover Rose Bagatelle over lips before dabbing a hint of Rose Monceau at the centre – results are guaranteed! A touch of liner to illuminate eyes and define one's mood of the day! Two brand new shades for pure pop eyes with Khôl Hypnôse Vert Tuileries, or subtle yet intense eyes with Gris Rivoli. Used alone or alongside My French Palette, these Khôl pencils adorn the lash border with a hint of springtime lyricism. Add a hint of pop to the smoky looks of My French Palette by applying Khôl Hypnôse Vert Tuileries to the upper lash border. Sitting on a Parisian bench against a mint green backdrop, Alma Jodorowsky embodies the French Innocence collection. Her hair deliberately dishevelled and cascading over her shoulder, her eyes full of zest, her lips adorned with sweet pink and her manicure featuring a pastel nail art twist, the new Lancôme ambassadress shines through the lens of Mert Alas and Marcus Piggott. Aged just 22, actress and singer Alma Jodorowsky is the embodiment of Parisian spirit, able to apply the same passion tempered by breezy resolve to an array of different realms and always maintain her unique signature. Recently seen in Abdellatif Kechiche's award-winning Blue is the Warmest Colour, she has also just recorded her first songs with her pop-rock group The Burning Peacocks.